One of the latest trends for Jenn and I is to try new restaurants when we go to the theater. To celebrate the holiday season we finally went to go try Vaca a restaurant right across from South Coast Repertory and one of the most raved about restaurants in Orange County. When we made the reservations (almost a month ago) we found out that the head chef of Vaca is someone we are watching right now on Top Chef Season 13. Kind of a crazy coincidence. We arrived at Vaca a little before 6PM and got a seat in the middle of the small restaurant. Although the restaurant looks large from the outside it only seats around a hundred or so. Jenn started out with a glass of red wine and I had their house cocktail. Both were sublime. When we sat down we also got some mixed Spanish nuts that were freshly roasted. I went through those in a few minutes. We started out with two tapas at the start of our meal. The first was the La Bola which is crispy potato balls with ground beef, aioli, spicy tomato sauce. We had some incredible potato dishes when in Barcelona and that kept this streak alive. These were phenomenal. However, the standout tapas was the Erizos Con Huevo which is scrambled eggs in a sea urchin served with small peices of bread and butter. This was out of this world. 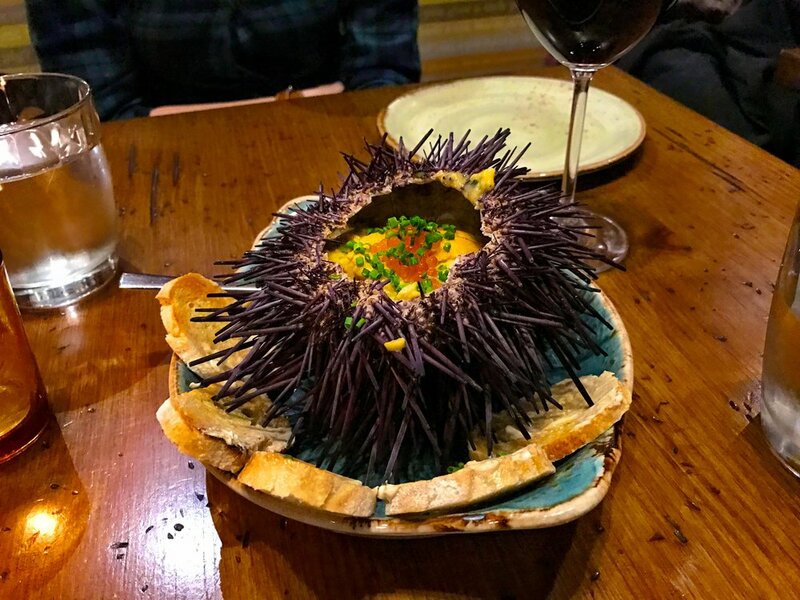 You would take the scrambled eggs out of the sea urchin and place them on the bread, the flavor and taste were really incredible. For our main entree we shared the Paella de Carne. Paella is one of the signature dishes at Vaca and the carne version did not disappoint. It came packed with pork belly, chorizo, blood sausage, duck confit, beef cheek, and bomba rice. Although the size seemed daunting for two people we made our way through it with ease and loved every bight of it. To accompany our delicious paella we both had another glass of red wine to go along with it. To close out the meal we had their churros con chocolate. Which as the description sounds is churros with a side of chocolate. They too were really good and a nice way to close out one of the best meals we have on this side of the Atlantic this year. 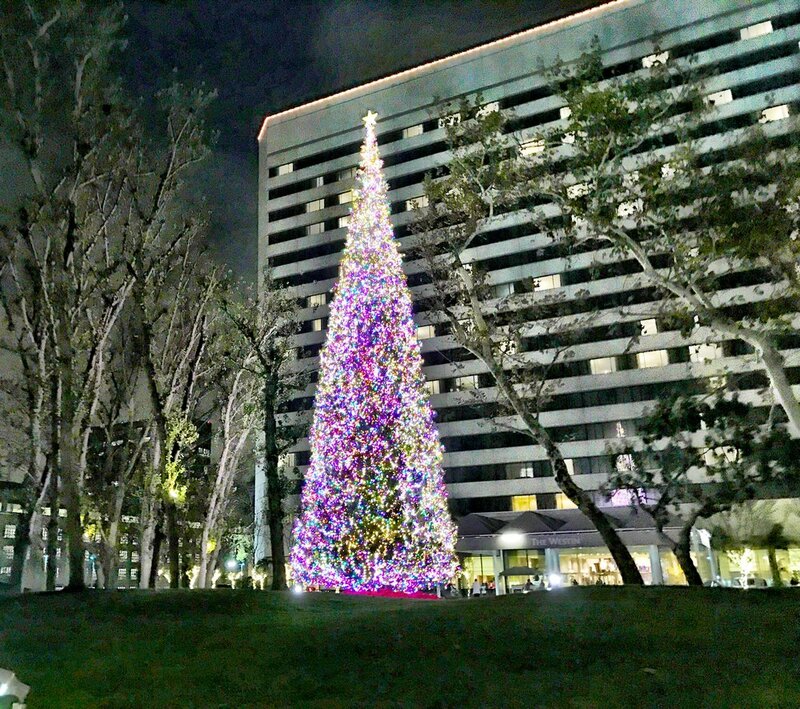 After our amazing meal at Vaca we walked the short distance to South Coast Repertory to see the 37th annual showing of A Christmas Carol. 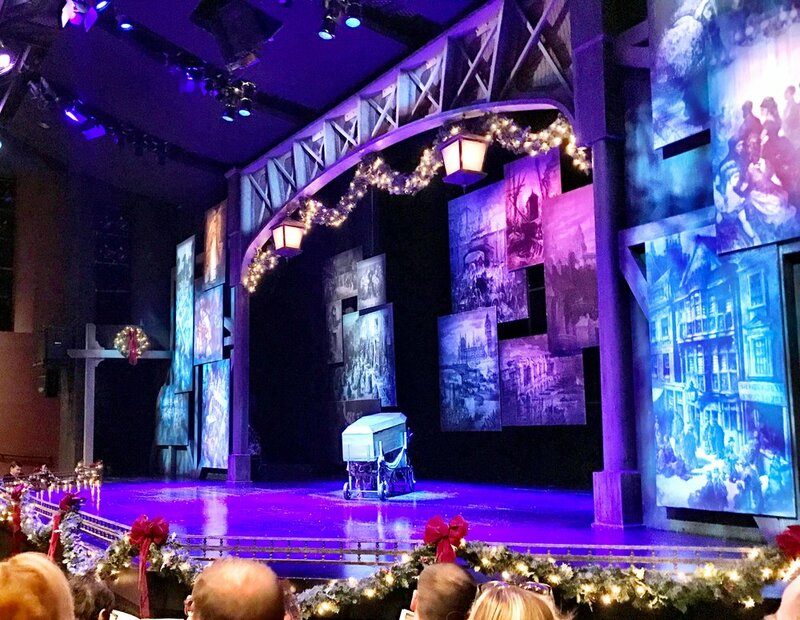 Although we've been frequenting South Coast Repertory for years this is the first time seeing A Christmas Carol. I'm not sure why it took us this long but I can guarantee this won't be the last time we go. It was such a magic experience. Even though we of course know the infamous story of Scrooge the joy of seeing it in a sold out theate two weeks before Christmas was something I'll never forget.